Looking for a bow which is difficult to break? Then you hit the right button. Today we are going to discuss regarding such a bow which is stylish in appearance but accurate and durable enough for family fun or backyard shooting or trips into the woodlands. Yes! The SAS Explorer Bow - Metal Riser Takedown Recurve Bow born to last forever. This traditional style SAS explorer bow is a good Southland Archery Bow and made of maple laminations and strong fiberglass which has the flexibility and durability that need by a novice archer. The high-strength casting aluminum riser means challenging to get this thing to break. It comes with five different color options to enjoy your shooting with style and raising envy among the friends. To explore more about this well-designed aluminum riser takedown recurve bow, stay with us and read the below features carefully. To check the latest price, you can click here too. 22, 24, 26, 28, 30, 32 & 34 Lbs. There is a proverb “love at first sight” which is proof correct for this beautiful SAS Explorer Bow. The five different color – Red, Blue, Black Marble, G1 Camo and Pink Muddy Girl all are shin in your grip as like gem. Not limited to looks only, the performance of this Explorer Bow also outstanding. Riser constructed with high-strength aluminum casting which ensures durability against any abuse by the children or teenagers. It is also treated as a long-lasting bow among professional archers for their shooting practice. However, the riser allows only the right-handed persons only. The plastic grip ensures comfort to hold the riser in round the seasons, means without feeling too hot or cold shock. Furthermore, the casted part comes with threaded holes to fit any attachments as per your wish. The limbs of SAS Explorer aluminum recurve bow made of fiberglass and laminated with Maple wood as like other modern bows. This blend ensures that the outer part of the bow will look gorgeous without negotiating its duty. The strong arms not only helps the bow have increased durability but also have better flexibility. The limbs are takedown which easier to assemble and disassemble makes it easy to carry and store. The interchangeable wings among the sizes help one to upgrade from lower poundage to a higher one without changing the entire set. The SAS Explorer comes with draw weights of 22 to 34 pounds which is pretty suitable to develop skill level and body build. However, you may think that it not designed for hunting, which is not correct. With this 66 inches bow, you can quickly develop higher pullback power. Optimum draw lengths and a right arrow with 34 pounds draw weights can shoot a deer from 30 yards distance smoothly. You can also set a reel, fishing rest, and a fishing arrow to shoot spring carp. Yap! A full 30-inch draw can generate enough power required for hunting game. First I like to say that, this incredibly lightweight aluminum recurve bow is speedy and accurate in nature. These two attributes are most significant to any bow hunters as well as a target shooter. The SAS metal riser recurve bow designed to provide you with high accuracy, and you can shoot the target without deviation and disturbance. The six different draw weights that are 22-34 pounds helps an archer to hit the target with varying speed. The 66-inch bow is forgiving in nature too, which can minimize small faults of archer during shooting. In the box, SAS only include a 66’’ Explorer archery bow with assembling a string. Nonetheless, the bow riser comes with a threaded hole for allowing any accessories like sight, stabilizer or arrow rest. If you purchase this bow, you have also had to collect arrows, knocking point, finger tab or arm guard separately. However, you find all of these from amazon.com easily. Q1: What is the recommended height of archer for this bow? Ans: The recommended height of an archer is up 6 feet. However, little shorter or higher stature person also can operate this bow. Q2: Does it comes with a string? Ans: Yes. It comes with a string. Q3: Does it comes with an arrow rest? Ans: No. The package does not include any arrow rest. You have to collect it separately from the online market like Amazon. By spending a little extra of your budget of SAS Explorer, you can buy a SinoArt 66’’ metal riser recurve bow. It offers full package includes: one riser with two bow limbs, a string, a bow stringer, one arm guard, one finger tab, a recurve bow sight, a recurve bow arrow rest, a screw-on arrow rest, and two string nocks. It comes with draw weights from 20 pounds to 36 pounds, and the hard edges of the handle and limb pockets are rounded to provide a sleeker, lighter weight, and more comfortable experience during shooting. Both Explorer and SinoArt are right-handed bow and SinoArt 66’’ crafted with three different colors like red, blue and black. 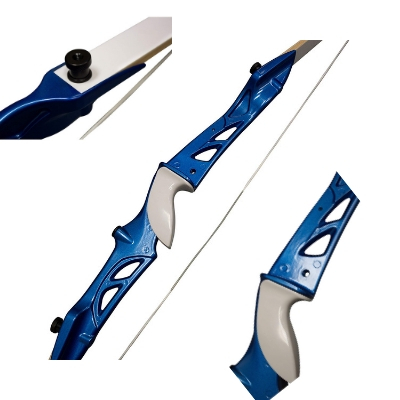 If you want a little extra by sticking with the same company SAS which has an established reputation, then you can check out the Spyder XL Takedown Recurve Bow and Arrow Set. Spyder is a wooden bow, and the package includes one bow, one pair of matching limbs, one 14-inch strand Dacron string, one stick-on adhesive arrow rest, and step-by-step instructions on how to bring together it. However, it expected that it comes with a bit higher price than the Explorer. Spyder XL designed both for lefties and right-handed person and came with higher poundage like 30 to 55. It also threaded with pre-installed brush bushing which allows you to set any accessories. Hence, if you like a bow with wooden riser and higher poundage for a more potential shot than you shift to Spyder XL, otherwise you can stay with this stylish and durable Explorer. The SAS Explorer Bow - Metal Riser Takedown Recurve Bow is a stylish and accurate bow. It is easy to bend but durable enough to withstand against day to day rough uses. The draw weight or pullback force makes it ideal for lighter activities like fun shooting, target practices, and archery competitions. It’s also a perfect bow if you want to learn how to hunt. Top of that, SAS is a reputable company and offer 3-years limited warranty support for this bow. So, you can keep trust on this head turner stylish red, blue or camo color bow.